Just having a read on your Jira integration module and trying to better understand how it works. When Jira/Community requests are linked, and synced, does it mean that the community request will gain the status directly from Jira? E.g if Jira task has changed status from 'in progress' to 'code review' . Would 'code review' show on the community request as it's status? Also with Jira task comments, would these populate on the community request comments? Once you turn on UseResponse plugin in your Jira account and match statuses for Jira tasks and UseResponse tickets, all data will be synced between Jira and UR - statuses, comments, custom fields etc. In order to achieve the scenario you described, you need to create custom status in UseResponse ("Code Review") and match this status with Jira task status in UseResponse plugin settings of your Jira account (see example attached). -Any status changes in Jira will be reflected on the ticket. There is no way to have 'hidden/private' statuses that the end user cannot see. -Any Jira comment will be added to the ticket comment as a public comment. You are right - any update on Jira side will be reflected in UseResponse and vice versa. 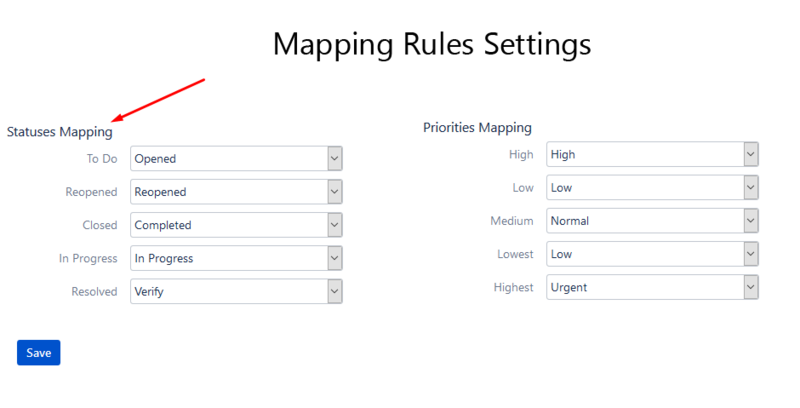 But when you move ticket into Jira, you can choose the option not to sync the data between Jira and UR. So it's up to you to decide which requests should be connected and synchronized.